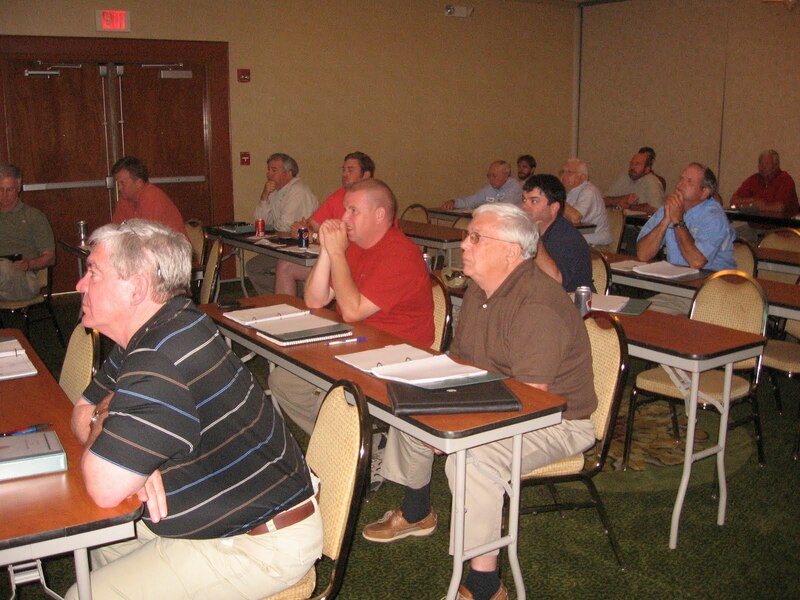 More than 25 people attended the Air School recently held in Santee, South Carolina. The school was designed primarily to educate SC gins with a new air quality rule they will have to be complying with in the coming years. 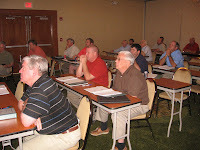 The attendees heard from the South Carolina Department of Health and Environmental Control (DHEC) on the new rule and what to expect when an inspector shows up. related activities (patching, inspection, etc.) there will also be weekly static air pressure readings. These readings will be made to ensure that the cyclones are running at design efficiency. In order to better understand how air at the cyclone is related to all other parts of a system, attendees learned how how behaves in a gin, where problems can arrise and the basics of gin air flow design. In addition to learning about cyclones and air flows, issues such matching capacities and taking basic air readings in a system were also covered. Finally, many of the attendees moved to a gin where participants got a chance to take actual air readings on one of the fans. This is also where additional information on ways of taking the requisite static pressures and the problems that are going to be faced with this. We would like to thank Kimbell Gin Machinery for allowing John Fabian to come and participate in the school as one of the main instructors. >Over the past year or more, the South Carolina Department of Health and Environmental Control has been working on a new rule to regulate air emissions from cotton gins. Stakeholders in the new rule (the gins in the state) were recently invited to DHEC headquarters to meet with those that are writing the new rule and express any concerns they have in the drafting of the new regulations. South Carolina has needed reform to the cotton gin regulations for a number of years. The current rules were written in the 70’s when few could imagine a gin plant being bigger than 15 bales per hour, much less a single gin stand doing that much. The rules barely worked for small gins but were impossible for larger ones. Additionally, SC is the only state in the cotton belt that requires a Professional Engineer (PE) to review and stamp every permit modification no matter how small the change. This adds significantly to the cost of permitting a gin in SC. Just a few years ago, significant changes were made to the whole permitting process in South Carolina. Among those changes was a provision for a “registration” permit for small plants that are essentially similar in their operation and control technologies. Cotton gins seemed like a perfect fit for this and we’ve been pushing to convert to this type of permit since the rule was passed. One of the biggest benefits to this type of permit is the elimination of a PE for small changes to the permit. The new rule, known as Standard 4 section V, is similar in many ways to the rule that North Carolina passed back in the early 2000’s . If passed in its currently drafted form, this rule will require properly sized cyclones on all exhausts for larger gins and allow fine mesh screen on the condensers for smaller (less than 20 bales per hour) gins. It will require the removal of rain caps that force the cotton out or down. It will require monitoring of air pressures in the cyclones once a week to make sure they are operating properly and it will require a bit more paperwork in the form of keeping a better log book. The benefits of the new rule are that it will no longer require a PE to look at all permit changes. Permit changes or renewals will be a matter of a letter instead of very complicated technical forms. It will ensure that the cyclones are in good operating condition. It will allow for better dispersion of the exhausts from the gin. And it will allow all the processes for staying in compliance become much easier. Ease of compliance is a major issue these days. Most of the issues we’ve run into recently have more to do with making sure the paperwork is done than it has to do with actual emissions. Ease of getting in compliance and ease of staying in compliance will go a long way to improving our appearance to the agency and the public. We look forward to continuing to work with DHEC on the development and implementation of the new rule when it takes effect in the next couple years.